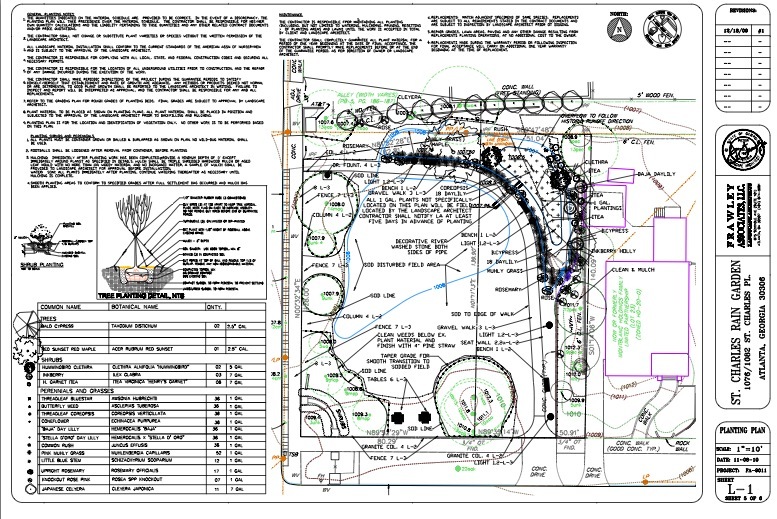 After nearly four years of fund-raising, designing, permit applications, and contractor selection, the Virginia Highland Civic Association and the Virginia Highland Conservation League are proud to announce that construction will soon begin on the long awaited New Park at the corner of N. Highland Avenue and St. Charles Place! Until the mid-1980s a public library was located on this site, which included a parking lot for the library. The library was demolished, but parts of the old foundation and parking lot are still evident. The property was then sold to a private owner and was in private hands for many years. Purchased in December, 2008, with a loan from the State of Georgia’s Land Conservation Program, by the Virginia Highland Civic Association, (VHCA) the 0.4 acre property became a privately owned (By VHCA) park for the enjoyment of the entire neighborhood. The plan is to create a Bio-retention demonstration project, where a very slight slope will be created to capture storm-water on the site and to re-direct this stormwater to the north edge of the property and away from the storm drains. The center of the site will be excavated to remove ground level concrete, old parking lot materials and debris that would inhibit the ability of water to stay on the site. A rain garden will be built on the center of the site, by scooping out a large area and then backfilling it with amended soils. Rain water will then flow to the graded down area at the north end of the property. Native Georgia plants will be placed on the periphery of the property. The large center of the park will be covered with local zoysia spreading grasses that are drought tolerant, requiring no additional watering, other that rain water, and no chemical fertilization will be done. So, the main area of the park will be used much as it is today for a variety of recreational and community activities. A granite seatwall will line the eastern boundary of the park and a granite dust pathway will follow from the southeast corner of the park from St. Charles Place all the way over to the alley entrance off of N. HIghland Avenue. A 4 foot tall iron fence will extend the west side of the park from the Gateway at St. Charles Place to the alley entrance, with intermittent short granite columns mimicking the Gateways. Three decorative light poles will also be placed on the border of the park for added security. There will benches and picnic tables and no trees will be removed from the site. The firm of Escape Outdoor Lifescaping, Inc, owned by Ryan Tracy, has been selected through a competitve process to construct the new park. The VHCA has signed a contract with Escape Outdoor Lifescaping and construction should commence on August 23, pending the city inspector go-ahead. Many people in our neighborhood have done a great deal to make this park a reality. First, the VHCA, under the leadership of President Pamela Papner made the decision in 2008 to purchase the park, and now under the leadership of President Jack White is moving forward with construction. Much has been done in the way of fundraising, led by Pamela Papner through the sale of engraved bricks (approximately 400 so far, and more can still be ordered), large donations by businessess and homeowners, and a very generous grant from Park Pride Atlanta of $50,000. 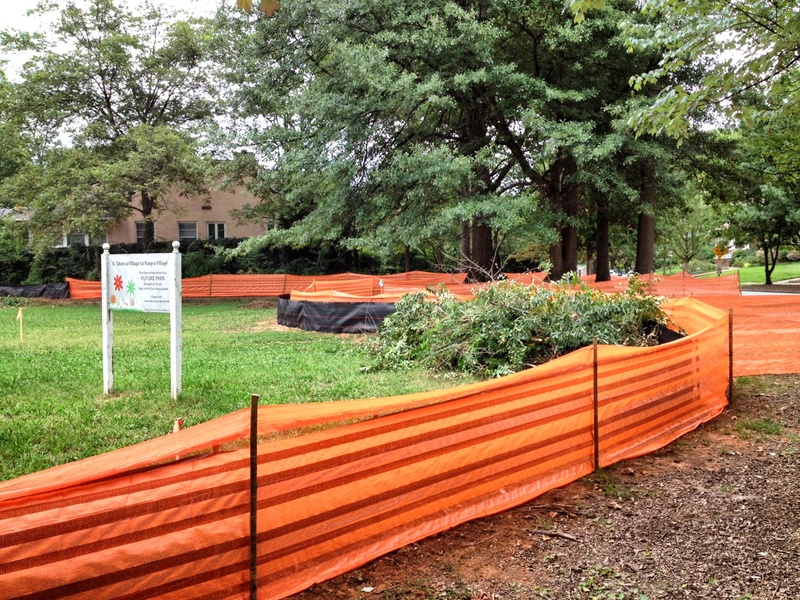 Also, we have received pro bono assistance from our neighbors in park design. Civil Engineer Peter Hughes donated his time to provide the initial site engineering and Peter Frawley, of Frawley Associates, Landscape Architecture, has spent the past 3 years designing the park and modifying the design to meet the needs of the neighborhood as well as assisting us through the lengthy city permit process. While money has been raised for the park construction, there is a continuing need to pay off the initial purchase price, as well as have some money in the bank for park maintenance and lighting costs. The Virginia Highland Conservation League was established as a IRS tax-exempt 501(C) 3 in 2009, for the purpose of accepting tax deductible contributions for each of the parks in our neighborhood-New Park, John Howell Park, and Orme Park. Also, as mentioned above, engraved bricks may still be purchased for $100 each. Continued donations are needed and we ask any and all to continue to contribute to our parks. Just make your check out to the “Virginia Highland Conservation League”, and send it to 1143 Saint Charles Place, Atlanta, GA 30306! If all goes well, the park should be completed in 4-6 weeks from the start date. 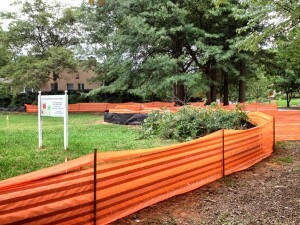 So, take a walk down to the corner of St. Charles Place and N. Highland and watch a park being made. And by the way, as you may have noticed, the park has no name. For anyone who donates enough money to pay off our loan, we will be happy to name the park for you! This entry was posted in news and tagged 2012, newhighlandpark by Kay Stephenson. Bookmark the permalink.